The Cosman G4 pain management RF generator is a State-of-the-Art design with a full touchscreen. 50-watt Radiofrequency output: Top of the class power to quickly heat 4 RF electrodes. Large, easy to see the digital display: The G4 Lesion generator has bright, color displays that enable pain management physicians to see impedance, probe temperature, etc. from the other side of the room. 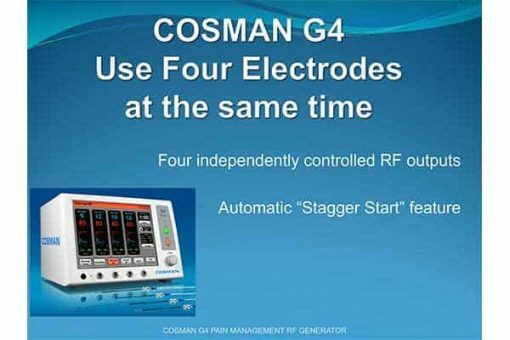 The Cosman G4 RFA generator has the ability to do most if not all pain management procedures. 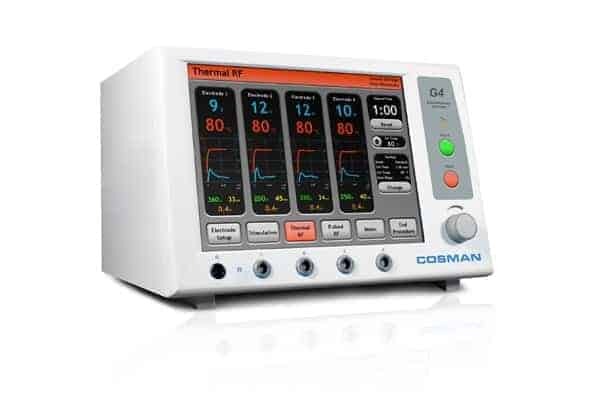 There is almost no training needed: The Cosman G4 radiofrequency pain management RF generator’s touchscreen display interface is fast to learn and easy to use, with crisp labels and user tips. Data Output: The G4 generator has a USB connection for output to a USB stick or to a printer. 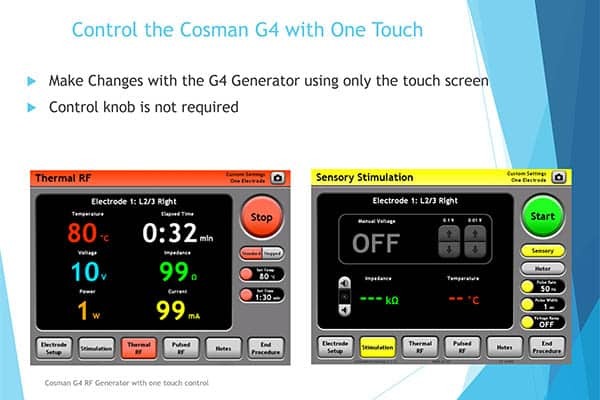 Cosman G4 generator vs Baylis – From Cosman Medical’s point of view. • Baylis “Smart Probes”, which are encoded TC Electrodes, do not allow the use of non-temperature monitored electrodes (such as RF pole needles). • Baylis computer screen has a small display. You cannot read displays from any distance away. There are many tiny text messages that are complicated and impossible to read unless you are very near. • During procedures, the user must operate the RF generator using an array of mechanical buttons and a control knob. • The Baylis pain management RF generator is not an intuitive generator. • The Baylis generator has “Secret” key combinations are required to perform some functions that require special training. 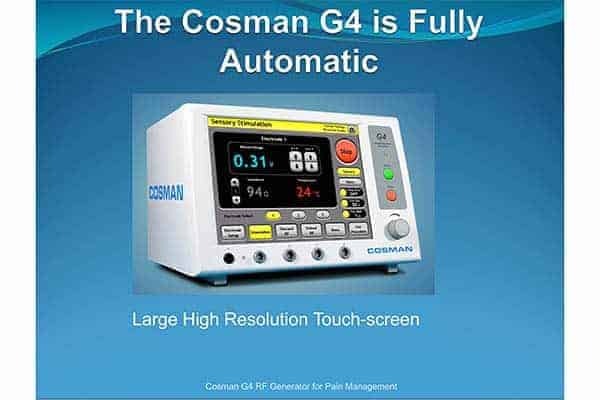 The Cosman G4 RF Generator is one of the top 2 four-lead radiofrequency ablation generators we sell. It is a great pain management radiofrequency generator, but almost impossible to find on the used market. When we do get them in, the Cosman G4 RF lesion generators usually sell the same day.